Magnesium deficiency occurs as result to its low content in soil, competition with other cations especially calcium and potassium and its removal by crops. This study was conducted to investigate the effect of applying magnesium at various rates and methods: as a soil application i.e. 0, 25, 50, 75 and 100 kg magnesium sulphate fed-1, and as foliar spray of 0.25 and 0.5% Mg twice on maize yield components, nutrient status and uptake and the relationships between Mg and both K and Ca for maize grown on two different soils during two summer growing seasons of 2015 and 2016. 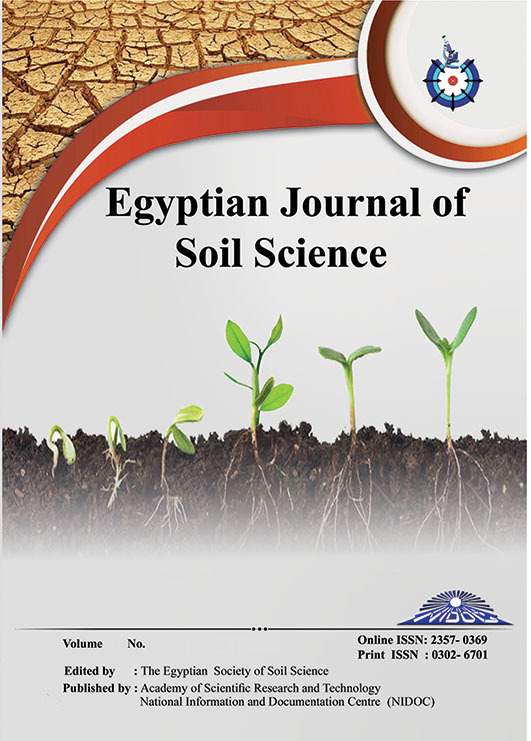 The first experiment was carried out in clay loam soil at Talkha district, Dakahlia Governorate (31° 16' 72.71" N, 31° 46' 25.80" E), and the second in sandy soil at Ismailia Agricultural Research Station (30.6° 35' 30" N, 32.2° 14' 50" E), Egypt. Results showed that the application of Mg-rates significantly increased grain and stalk yields, 100-grain weight, grain content of oil, protein, P, K, Ca, Mg, Mn and Zn, and the uptake of N, P, K, Ca, Mg, Fe, Mn and Zn by stalk yield, with the superiority for Mg-rates 50 Kg fed-1 and 0.5% Mg foliar spray in clay loam soil, and for the rate 75 Kg fed-1 in sandy soil. As well as relationships between Mg and K or Ca at ear leaf demonstrated that K:Mg and Ca:Mg ratios increased with the foliar spray of Mg and soil addition of Mg-rates up to 50 kg fed-1 in both soils.